You can ask my kids about this fact, but I have a soft spot for the old music instrumentals that were once more common on the radio and music charts back in the decades of my long-lost youth. 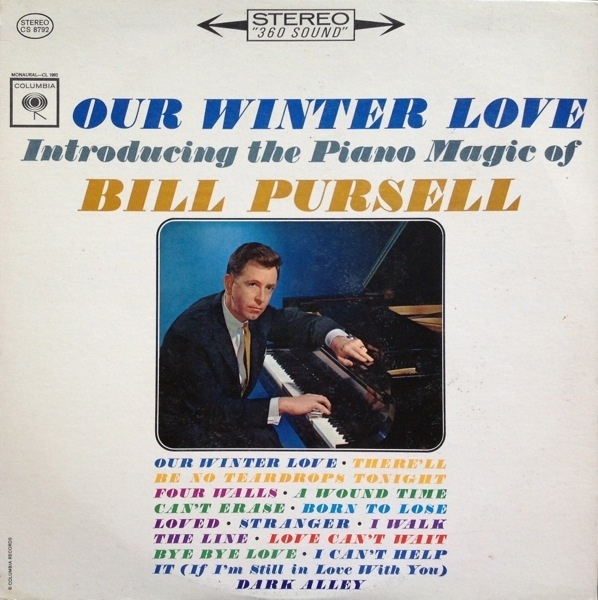 One of my long-time favorites, from 1963, was the Bill Pursell performed Our Winter Love. It endures as a hauntingly beautiful melody, IMO. Outside of the Percy Faith’s version of Theme from A Summer Place, it remains the one instrumental tune I most fondly associate with the ’60s. If my eighth grade music appreciation teacher were still around, she would soundly attest that I’m no music expert. That’s for sure. But, I know what I enjoy. While they both deploy their orchestral strings to sweet-sounding use, these pieces served a wonderful counterpoint to each other as they play out. That each song has a polar opposite season as part of their title also helped to establish that point, I think. “”Our Winter Love” is a piano instrumental remake by Bill Pursell of a song written by Canadian songwriter Johnny Cowell. The song ultimately became one of the biggest selling recordings of 1963 and has carved out a small but meaningful niche for itself in the annals of pop history. Initially, a trumpet solo demo of the song that was titled “Long Island Sound” by Johnny Cowell, was sent to Nashville to be recorded by well-known trumpet player Al Hirt who never recorded it. Pursell came across it one day and transformed it into a timeless classic. The song reached #9 on the pop charts, #4 on the adult contemporary charts, and #20 on the R&B charts. Our Winter Love was considered a major hit, reaching #9 on Billboard’s charts, for Columbia that year. As reported by Wikipedia, Bill Pursell afterwards “…worked as a session musician and arranger for Patsy Cline, Johnny Paycheck, Hoover, Joan Baez, Eric Andersen, Scotty Moore, J.J. Cale, Willie Nelson, and others.” He is currently on the School of Music academic faculty for Belmont University in Nashville, Tennessee. And if he reads this, I want to assure him that this song still has admirers and will not be forgotten by the likes of us — me, in particular. Thanks for researching and posting the history of this song. I also have a soft spot for this song and Theme From a Summer Place and I never thought I’d run into someone who felt the same! Also, I love how Mr. Pursell blends the guitar and sax together (at least I think that is what is going on) in one part of the song. The subtle blend of tonalities is unexpected and and at the same time adds to the emotional feeling of the song! Our Winter Love, A Summer Place, and Once a Upon aTime (from All American) are my favorite instrumentals! Many thanks for your wonderful, and heartfelt, comments (and memories) for my record. The original title by Johnny Cowell was Long Island Sound, but after we recorded it in Nashville, it was renamed at Columbia in New York (by two PR men) Our Winter Love. The irony of this is that the new title really,more aptly, described what we eventually ended up with on the recording. It proves that sometimes the reactions to already existing things, can prove to be more accurate than the original ones. Thank you for your post. It’s especially nice when the article elicits a response from the artist. I agree with him that the revised title matches the mood of the song better than the original title. I had heard this tune on the radio in the 70s without knowing the title or the artist, and as a result could not find it, until today. Like yourself, I associate this song and Theme from A Summer Place with my formative years. I first heard this beautiful instrumental in 1963 when I was 12 years old. I never forgot the beautiful melody and the rich blending of the instruments. I will be 67 years old next month and this tune still moves me. Thank you Mr. Purcell for this wonderful composition. Hear, hear. Thank you, John. Here’s a link to a very comprehensive write up about the song’s recording history by MC Antil. Of particular interest is the early use of guitar distortion during the sax/guitar duet!